Phase 2 of Apple's ambitious Campus 2 construction project is now well underway, with new testing workshops and facilities rising for research and development large enough for vehicle-size innovation work. Located between Phase 2 and the main "Spaceship Ring," Apple's new subterranean Theater and Visitor Center is also nearly complete. The first phase of Apple Campus 2--including its above ground and underground parking, theater complex and central Spaceship ring of office space--began to rise last winter. Our recent March 2016 Campus 2 report shows that the Spaceship Ring is now mostly enclosed in vast glass panels that are now being outfitted with white canopy fins, while the roof is being covered with massive plates for installing solar panels. 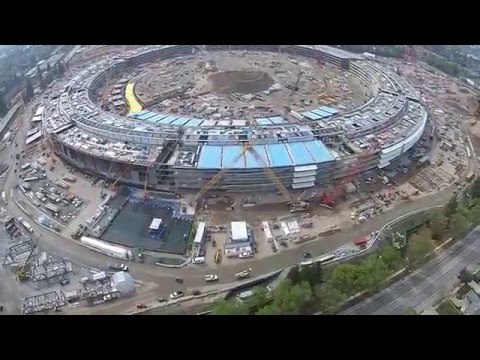 Our Campus 2, Phase 2 video (below) shows Apple's progress on the eastern side of the huge construction project. Echoing the design of the Spaceship and many of the company's newest retail stores, a new underground theater and visitor center are capped with a circular grand entry surrounded by glass panels (currently backed with a white covering). The underground portion is now covered, and the entrance structure is now prominently visible from the street (below) and in aerial images (as shown in the video above). The theater and visitor center complex--which will include a 120,000 sq ft assembly space with seating for 1,000 as well as kitchen facilities and a large lobby area--were little more than a hole in the ground just one year ago, as seen in the photo below from our report last March. The project's Phase 2, involving a strip of additional buildings centered along North Tantau Avenue (the eastern boundary of the Campus 2 site), originally planned to provide additional research and development space on the site at some point in the future. That parallel project is now well underway itself. Planning changes made last winter modified the original Phase 2 outline (which began as ten small R&D buildings), resulting in a new plan for fewer but significantly larger research and testing facilities on the east edge of the site, with new buildings all echoing the clean, simple lines and glass curtain walls of the central Spaceship. To make way for the sleek new low-rise glass R&D facilities, a series of existing buildings along North Tantau Avenue have been removed. The first to go were visible in our previous Campus 2 flyover reports over the last year. The obsolete buildings are being replaced by highly efficient, modern facilities with improved, drought-tolerant landscaping and less surface parking. The old office buildings sat on the east edge of the city line of Cupertino. Across a fence, a series of very different suburban residential streets define the western edge of Sunnyvale. The Phase 2 project area also borders Jenny Strand Park, including picnic grounds, tennis courts and a large green lawn that employees will have access to through the property barrier. The new buildings of Campus 2, Phase 2 will be stitched together by a boardwalk and landscaping featuring a variety of redwood, oak and other deciduous trees paired with sustainable ground cover designed to require minimal irrigation. A dedicated five story parking garage will house 620 vehicles for Phase 2 workers. That building (shown today at the street level, below) is now rising from its basement foundation. It, too, will feature a roof covered with solar panels (similar to the two primary parking structures of Campus 2) in order to help offset its energy use, even prior to accounting for the separate off-site solar array the company is funding in rural Monterey County located south of the Campus 2 site. The new parking garage's solar panels will in particular help offset the energy use of the facility's 32,000 square foot data center planned for its basement, likely dedicated to the research, testing and workshop activities related to Phase 2 activities. Viewed from above, a series of sleek, white rectangular buildings--housing an additional 2,200 employees--are planned for the 16 acres at the southeast corner of the Campus 2 site along North Tantau Avenue, where it crosses the 280 freeway, east of the large main Campus 2 parking structures now under construction. The timing of the Phase 2 redesign correlates with Apple's reported moves to focus on development of an automotive product. AppleInsider outlined the company's automotive industry inclinations back in 2012, but recent mainstream media reports that suggest the company plans to develop an entire vehicle are relatively new. That indicates that Campus 2's Phase 2 R&D and testing facilities were realigned last fall, likely in order to address an evolving strategy involving much larger products than Apple has ever designed and built before, whether a car or vehicle information systems the company would be testing within vehicles. The largest building in the Phase 2 cluster is a four story, 300,000 square foot office building (below) devoted to research and development, featuring expansive curtain walls of glass that provide unobstructed views of the surrounding landscaping. The main Phase 2 building includes one level of 280 underground parking spaces--including facilities for electric vehicles--with limited additional parking on the surface, making room for plenty of bicycle parking and open landscaping. Apple may intend to use these new buildings to develop an electric vehicle--potentially even a self driving car--but the Phase 2 R&D campus expansion itself is designed to encourage employees' transit use, ride sharing and bicycle commuting, a significant shift from the previous car-centric suburban sprawl it replaces. The Phase 2 site's former 103,000 square feet of office space at Ridgeview Court 1 (below) was demolished last January. Expansive surface parking lots previously covered most of the open land surrounding the buildings. Over the past year, Apple used part of the former parking lot to build a mockup prototype section of the Ring for testing. That temporary structure was also removed last winter, leaving a bare lot on a island of land separated from the rest of the Campus 2 site by Calabazas Creek. The main Phase 2 building will also include a kitchen, espresso bar and dining facilities overlooking a landscaped outdoor seating area along the creek. The southern boundary will feature an acoustic wall to help shield the site from freeway traffic noise. The street side of the building will be partially obscured by new trees (below), while the secure and private inner side will be surrounded by landscaping. Planning documents indicate that the site's secured, secluded and serene location are key elements in its design as an R&D facility, giving designers a relaxing, reflective space to develop new products and the technologies that will power them. Across the street, a pair of two story testing facilities will provide 222,000 square feet of additional workshop and office space, replacing Apple's former buildings at the Tantau 1 and Tantau 2 locations (now bare lots) and nearly doubling their existing 146,000 square feet of office space. In place of the previous buildings' surface lots, the five story parking structure (now under construction) will provide room for 620 vehicles as well as a 32,000 square foot data center located in its basement. Apple's architects presented proposed renderings of the parking structure both with and without mesh panels, both featuring a design complementing the circular main campus and reflecting the minimal, open design concept previously used in a series of new Apple retail stores, including the company's nearby Stanford store. A third office building to the north of the creek will contribute another 84,000 square feet of space in a smaller two story structure of a similar design, at the location of existing Apple buildings at Tantau 3. The R&D, testing workshop facilities and server data center of Phase 2 will complement the 2.8-million-square-foot Spaceship designed to accommodate 12,000 employees, along with a fitness center, auditorium, transit center and other amenities. AppleInsider recently presented a video overview (above) of construction progress in the March 2016 Campus 2 report. I wonder if they'll use the new parking garage and theater for their annual Autumn event this year. If it's open in time I don't see why not. Expect this project to have architectural significance for 50 years. I don't know why you don't just embed Duncan's videos in this post. His latest video released in the past day is by far his best yet. If Apple wants to keep and up its market share one of the main axis to stick to is and will be wireless charging of its devices Later on it can easily transfer the tech to EVs also. Think it's going (ought) to be one of a few focal points to work on - the sooner the better. It's kind of more than annoying to track the battery status all the time and then plug it in to recharge. Apple, why not change it ? Not sure I get the connection to this article but I agree 100% wireless charging even if a very small distance, for a whole bunch of Apple devices at the same time is the future. I am so sick of white wires everywhere in our home!